"Yesterday was EDI, today DDI has the potential of revolutionize effective workflow in the offices! " DDI, the direct integration of importing documents in real time into the business partner ERP system, is the logical development from our under the firm esc/e e.K. since 2001 developd and marketed EDI converter solutions as well as our Communictaion Tools for AS2. With DDI there are opening a lot of new audience for the electronic data interchange between companies:	All companies which are active in the b2b sector. For this reason we tranfered this projekt into the start-up ediware UG (haftungsbeschränkt), later the ediware GmbH . The DDI model is using standardized methods and techniques which are daily used for many years. 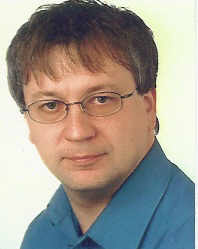 This contains the export from the ERP system of the document sender, which is already realized as an interface to the EDI converter EDI4ALL by over 100 existing software partners, through the conversion into a standardized EDIFACT format and the transmission of data using certified AS2 connections, to the automized import into the ERP system of the business partner. All this happens to terms which are roumored and have nothing to do with classic EDI soloutions in spite of EDIALL: High prices! You find here our by now over 100 existing software partnes. 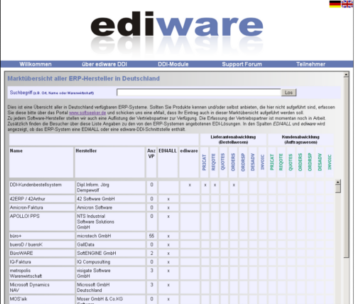 We created a market survey over ERP producer including using our or other EDI solutions using data from the software database www.softseeker.de. 1. Software partner/Project partner which developing ERP software, for implementation of interfaces between the ediwareBOX and the ERP system, the modules of "DDI-IO-Export" and "DDI-IO-Import". for marketing and supporting user of "ediware DDI"
after many months of development time the first version of ediwareBOX is available for use. For the product launch we offer several businesses the possibility of integraten of up to 100 business partner with "ediware DDI", without charge. As launch customer you don't have to pay the monthly basic charge of 29,- Euro. Only for internal resources or by a third party may be costes incurred. We contact your business partner and their erp provider and support these with installation and configuration of the software. Your business partner can use ediwareBOX for free, too. Not before they exchange messages with, for example, competing companys, the use will be charged!